The Key Pieces: Who would own a desk like this? In the rectangular room, with a light coloured carpet and large mirrors situated at the far end. This trestle table with two supports belonged to the late designer Yves Saint Laurent. The desk is piled high with books, various well organised pen pots and a selection of cult objects. Behind the desk there is a framed portrait of Yves by the French Expressionist Bernard Buffet and a cork board where Yves pinned sketches, inspirations, quotations, photos of friends, press clippings and his famous 'Love' posters which he sent every year to friends and associates. Underneath the desk, was a bed and toys for his French bulldog, Moujik. 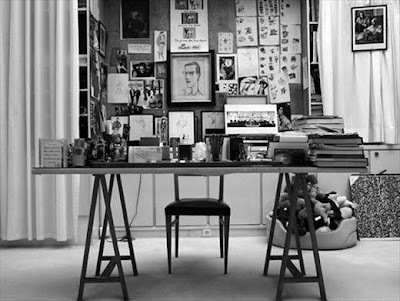 The work station was situated in the far corner of his Avenue Marceau workshop, where the designer worked from 1974 up until his retirement in 2002.